Novum Structures LLC will pay $3 million to settle criminal and civil False Claims Act allegations in Wisconsin federal court that it falsified documents to hide the improper use of foreign materials on construction projects funded with federal dollars, the U.S. Department of Justice said Tuesday. The Wisconsin-based manufacturer of glass space frames — found in roofs and atriums — agreed to plead guilty to a single count of concealing a material fact and fork over $500,000 in criminal fines to resolve allegations that it hid its noncompliance with requirements to prefer American-made materials in federally funded construction contracts, the Justice Department said. "When taxpayer dollars are provided for construction projects, the government expects contractors to comply with all requirements, including ones that ensure the money remains in the U.S. economy," Principal Deputy Assistant Attorney General Benjamin C. Mizer said in a statement. "This settlement shows that the Department of Justice is committed to pursuing claims against contractors that put financial gain ahead of complying with the law." Novum also agreed to pay $2.5 million to settle a civil FCA suit alleging it knowingly violated its contractual obligations in using "noncompliant foreign materials" on construction projects funded by U.S. taxpayers between January 2004 and July 2013, according to the Justice Department. In addition, Novum agreed not to contest its disqualification from working on projects funded with federal money, the Justice Department said. Novum Vice President Travis Loften said Tuesday that the company takes full responsibility for its actions and has improved its internal procedures to ensure future compliance. Loften noted that the allegations are only of products' country of origin, rather than their quality. "We have taken action to resolve the vast majority of the noncompliance issues, in many cases replacing noncompliant foreign-sourced products with Buy American-compliant counterparts," Loften said in a statement. "It is also important to note that the Buy American requirements applied to a very small part of Novum's business. Additionally, the noncompliant materials used represented a small fraction — less than 3 percent — of the value of the work on the few projects that were subject to Buy American requirements." The FCA suit was first filed under seal in August 2012 by whistleblower Brenda King, a former Novum employee who worked at the company from June 2004 through March 2012, according to the complaint. The government intervened in the case on New Year's Eve and it was unsealed Monday, according to court documents. King stands to receive approximately $400,000 from the civil settlement. 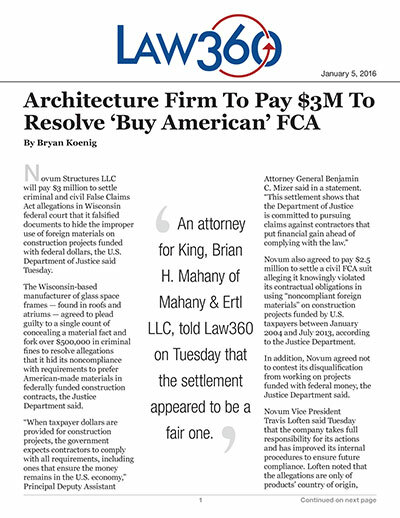 An attorney for King, Brian H. Mahany of Mahany & Ertl LLC, told Law360 on Tuesday that the settlement appeared to be a fair one. King's complaint alleged, among other things, that Novum used Chinese- and Italian-made materials while working on a ground transportation hub adjacent to Miami International Airport, a project that was commissioned by the Florida Department of Transportation and paid for in part by the U.S. government. Novum was paid $1.46 million for the first part of that contract and won a new contract for $13.5 million for further work, King said at the time. For a New Orleans streetcar expansion project commissioned by the city's Regional Transit Authority and partially federally funded, King alleged that Novum used materials from China and Germany under its $515,000 contract. King alleged that Novum used materials from those countries for another $110,900 contract at an Illinois federal courthouse. King alleged that she was repeatedly told to lie and falsify records to hide the Buy American noncompliance. King is represented by Brian H. Mahany of Mahany & Ertl LLC. The government is represented by Stacy C. Gerber Ward, Michael D. Granston, Patricia L. Hanower, Christelle Klovers and Lisa T. Warwick with the U.S. Department of Justice. Attorney information for Novum was not available Tuesday. The lawsuit is United States ex rel. King v. Novum Structures LLC, case number 12-cv-00860 in the U.S. District Court for the Eastern District of Wisconsin.